Mike was in the studio Saturday tracking Drums for the album. 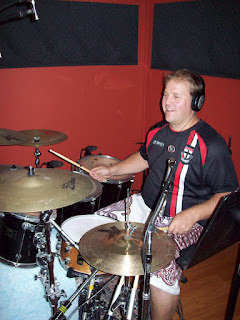 Mike's son Shane was playing the drums and the session went very well with the 5 tracks that we planed to do being completed in time for us to have the evening off. Shane played to the guide vocal & guitar along with the click track. The only slight down side of the day was that Shane turned up with a St Kilda shirt on, however this was soon offset when he told me he had bought a Freo Dockers membership for this season.